Becca Hart in MARY POPPINS. Photo by Devon Cox. Mary Poppins may be returning to the silver screen with a new Disney film Mary Poppins Returns but the original movie starring Julie Andrews exudes a timeless essence that continues to enchant audiences today. 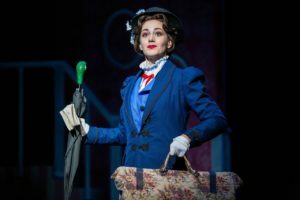 You can relive the magic of Mary Poppins with The Artistry Theatre (Bloomington Center For The Arts, 1800 Old Shakopee Road)’s production of the Broadway musical adapted from the Disney movie and the books of the same name by P.L. Travers. The show, with performances running from October 6th through November 4th, is perfect for the whole family and Artistry welcomes young audiences, understanding the importance of fostering an appreciation for the arts in new generations of theatergoers. Mary Poppins is directed by Joel Sass and features a cast of seasoned Artistry veterans and debut performers. The story follows the Banks family as they try to find a nanny able to keep up with mischievous siblings, Jane and Michael. Mary Poppins, a nanny with a few tricks up her sleeve appears just in the nick in the time to help the family realize what’s really important in life. Becca Hart in the title role is, as one of her main songs suggests, “Practically Perfect” as Mary. Hart and C. Ryan Shipley, playing the cheerful chimney sweep Bert, share a delightful chemistry onstage. Expect to hear all your old favorites such as, “A spoonful of sugar,” and “Let’s go fly a Kite,” but part of what makes Mary Poppins so enjoyable are the new songs and scenes written for the musical. One character that completely owned the stage and livened up the show after a long first act was Brandon A. Jackson in the role of the “holy terror” Miss Andrews. Miss Andrews, the old, impossibly strict and cruel nanny of father Mr. Banks bursts onto the stage and in true Disney fashion, sings about how to keep unruly children in line. While the first act is a bit long and drags in some places, it’s Jackson’s perfectly timed performance as Miss Andrews that reels you right back into the action. Colorful costumes, clever set changes, and catchy show-stopping numbers all help bring the magic of Mary Poppins to life at the Bloomington Center for the Arts.